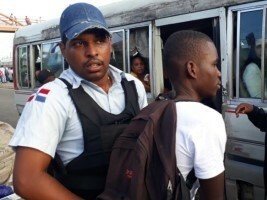 The Directorate General of Migration (DGM), informs that they are operating in the provinces of Santiago, Azua, Duarte, Espaillat, La Romana, Puerto Plata, Valverde, Peravia, La Vega, Puerto Plata, Montecristi and the Greater Santo Domingo, during which 2,805 Haitians were controlled. The inspectors of the DGM during these operations were assisted by members of the Dominican Armed Forces, the National Police in coordination with the Public Ministry of the Provinces. After the verification process 2,081 compatriots (74%) were declared in the United States. and deported to Haiti. According to data from the DGM, in 2018 132,322 Haitians were expelled or turned back from Dominican territory. 57,190 were deported after being controlled on the territory where they lived in an irregular migratory situation, while 75,132 were turned to the border for non-compliance with the migration law by the territory illegally.